As you get older, age, weight and genetics can all take major tolls on your chin, neck and jawline. The fact is, that with these factors, you can’t just exercise away that excess fat and improve your profile. So what can you do? Beware of the Turkey Neck! A nice profile with a defined jaw line is desirable for anyone. Unfortunately, some people are just born with a little extra fat under the chin. It is frequently a genetic gift from your parents. There is also a tendency to develop excess fat in the neck as we age. No exercise will eliminate the loose skin and excess fat that accumulates in the chin, neck and jowls. Liposuction can be a great option for people desiring a more refined neck and jaw line. This is an area that can be more delicate than other areas of liposuction and it is important to seek out the opinion of someone who can offer you several options. Fortunately, chin liposuction can remove the excess fat and help restore the more defined jawline that you had in years past. In fact, with the laser assisted technique that we use, SmartLipo, in addition to removing the fat we can also tighten the skin in the area. Skin tightening can enhance the results of the procedure and add to the overall improvement in your profile. Our medical director is highly trained in facial plastic surgery having performed literally thousands of procedures on the face and neck. Because of this, we consider ourselves a particularly good option for people looking for this kind of neck rejuvenation. With excess fatty tissue in the neck, we most frequently recommend laser liposuction under local, tumescent anesthesia. Dangerous general anesthesia and IVs are not used. With the tumescent technique, a local anesthetic is used to numb the area and the patient remains awake throughout the procedure. Two small incisions are made under the chin (one on each side) for access for a tiny laser fiber which is used to melt fat and tighten skin simultaneously. A very thin cannula is then placed through those same tiny incisions to vacuum away the melted fat. Laser liposuction is a safe, permanent procedure that eliminates fat and tightens skin around chin, lower jaw line and neck. The procedure only takes about thirty minutes and recovery time is minimal. There is very little discomfort after the procedure. The tiny incisions are hidden well and are not noticeable. What are the benefits of chin/neck laser liposuction? The biggest benefit to laser liposuction of the neck is improving your profile. 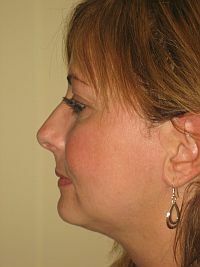 You can expect elimination of unwanted fat in the chin region and a better defined jaw line. The laser also creates a tightening effect which can significantly improve hanging skin. Laser liposuction may be an alternative for people who want to avoid a neck or facelifting procedure. Tumescent laser liposuction or liposculpting is performed on-site in our safe, state-of-the-art office so there are no additional fees. Patients are lightly sedated and the procedure is done under local anesthesia. There is no dangerous general anesthesia and there is no need for IVs. Patients are numbed and then two tiny incisions are made below the chin where they are not visible. A very fine laser fiber is then used to melt fat through these tiny incisions. As the fat melts, the skin is stimulated to tighten as well. Once the fat is melted, it is gently suctioned out. The entire procedure takes less than one hour. Patients are not permitted to drive home because of the sedation administered during the procedure and will need to be picked up after the surgery and driven home. Am I a good candidate for chin/neck laser liposuction? Tumescent laser liposuction of the chin, jaw and neck is ideal for men and women with a "double chin" who desire more definition of the neck and jawline. We do not believe that laser liposuction is a good option for individuals with significant jowling. For this, patients are advised to consider our UpLift™ procedure. Anyone who is over the age of 60 may need additional procedures to obtain the desired look. A complimentary consultation with the doctor can address any questions you may have. Can chin/neck laser liposuction be combined with other procedures? Absolutely. Tumescent laser liposuction of the chin can be performed at the same time as any other procedure so that you can customize and perfect your problem areas. In addition, the UpLift™ procedure may be performed at the same time for older patients who may also have significant jowling or neck bands. Will the procedure leave scars or excess, sagging skin? Only one or two tiny, well hidden incisions are necessary for the procedure. These incisions heal very quickly and scarring is never an issue. Younger individuals with good skin tone will typically not experience sagging skin after the procedure. This procedure is designed to promote skin tightening as the fat is removed. Unless your skin is already very thin, wrinkled, or lax due to aging or dramatic weight loss, you will usually see an improvement in skin tone and firmness. Older patients and people who experience considerable weight loss may be better served by our UpLift™ procedure. What are the post-surgery side effects? The procedure itself is virtually pain-free and we are often told that the experience is easier than going to the dentist. You will be able to resume normal activities immediately after the procedure and return to work in 2-3 days. All patients need to commit to wearing a compression garment similar to a headband continuously for 72 hours in order to minimize bruising and swelling. Mild swelling and or/bruising is possible but subsides quickly. There are no stitches and the tiny incisions will close up within two days. You can continue to wash and shave your face normally after the first 24 hours. To learn more about Chin, Jaw and Neck laser liposuction or water assisted liposuction, please contact our friendly staff to set up a free consultation with our doctor.